It’s not exactly accurate to say that I am an alum of the graduate program in history at CMU because I quit the program almost as soon as I began, realizing very early on that I didn’t have the guts for the kind of work it required. But I never quit a real and genuine interest in history as a discipline and as a way of asking questions about the world. After quitting, I became a librarian and have been working in libraries for about six years now, including a stint at the Clarke Historical Library. I have never been directly cut off from the world of professional historians, much less people associated with, in one way or another, CMU’s history department. When Marcel asked me to contribute to this blog, I wanted to say no. What would I write about? I am not even an alum! I thought about it for a bit and remembered that a question had been circulating in my mind for the last couple days as a result of my current job teaching research methods (supposedly) to the children of the wealthy elite at a private high school in Mexico. It turns out that some of these privileged teenagers have a genuine and somewhat enthusiastic interest in “history.” Specifically, they are nostalgic for a period of time in Mexico that neither they nor even their grandparents actually experienced: the dictatorship of Porfirio Diaz from 1876-1911. As a casual student of Mexican history, this nostalgia startles me. The most widely accepted scholarly narrative of the Porfiriato, as the period is known in Spanish, is that it was characterized by, among other things, a dictatorial government that restricted the rights of the people of Mexico. In addition, the regime carried out organized violence against rural and indigenous communities in order to forcibly implement its idea of order and progress in the country (Turner 1969; Balbas 1927). How could Mexican teenagers in 2019 be nostalgic for that? It would not be a stretch to use this same language to describe the last couple decades of neoliberalism in Mexico, and I believe my students are unconsciously aware of this. They perceive that with the election of AMLO to the presidency, this period is coming to an end. Perhaps, then, their anxiety and invented nostalgia is logical? 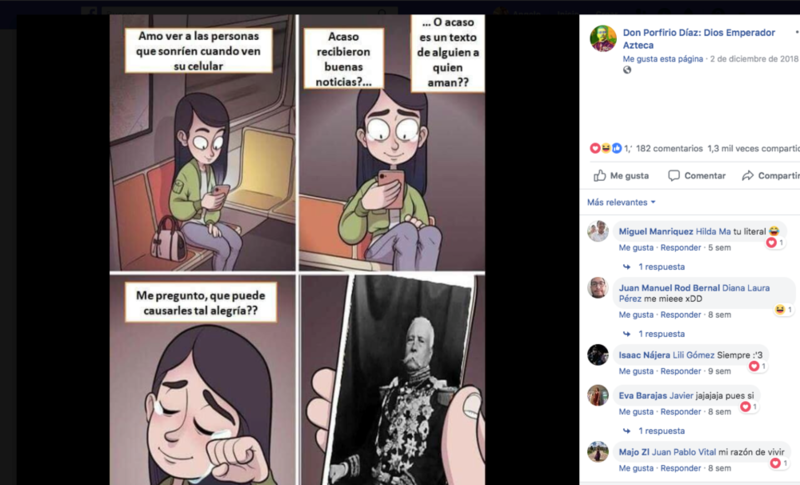 Screenshot from a Facebook page dedicated to posting humorous material in support of former Mexican dictator, Porfirio Diaz. For those of us who have imagined and fought for a world in which many worlds fit, and a world free of exploitation and oppression, these are scary times in the western hemisphere. It would be easy to simply write off this Porfirian longing as bizarre, “ignorant,” and marginal, but I fear that it is more than that. I fear that my students are genuinely willing to defend their privileges and comfort up to the point of accepting and supporting a political regime that uses violence and coercion to maintain “order” and to keep them isolated from the great majority of their compatriots. Nostalgia and history are not the same. Historians have a duty to aggressively interrogate nostalgia if they are interested in truth and justice. Turner, J. K. (1969). Barbarous Mexico. Austin: University of Texas Press. This is a participatory community. Click the Newsworthy link to see the latest department news and resources. Contact us with questions or content ideas. Or, see the Submissions link for guidelines.